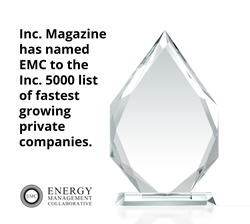 Energy Management Collaborative (EMC) today announced that Inc. Magazine has named it to the Inc. 5000 list of fastest growing private companies for a third consecutive year. The list represents a unique look at the most successful companies within the American economy’s most dynamic segment— its independent small and midsized businesses. EMC’s 249% growth over the last three years put the lighting conversion and service solutions provider at 1,582 on the Inc. 5000, up significantly from its rank of 3,471 in 2016. Recognized as a Top Minnesota Company, EMC is one of 86 companies on the list with headquarters in Minnesota and one of 91 companies recognized from the energy industry. The average company on the list achieved a mind-boggling three-year average growth of 481%. The Inc. 5000’s aggregate revenue is $206 billion, and the companies on the list collectively generated 619,500 jobs over the past three years. Energy Management Collaborative (EMC) provides energy efficient Lighting + Controls + IoT solutions for a broad range of retail, commercial, industrial and government clients in North and South America. Since 2003, the company has used its trademarked project management approach, EnergyMAXX, to successfully implement turnkey lighting upgrade projects, saving multinational clients over 3 billion kilowatt-hours of energy.